The women’s catwalk shows for autumn/winter 15 are in full swing but what are the key trends to adopt now? The new styles and hip colours that will fast-forward your outfit for spring and still look fresh come autumn? Here are five trends I spotted at London Fashion Week – seen on the runways and on fashionistas, too – the hero pieces we’ll be sporting come autumn, so why not start wearing them today? The quickest way to update your look? Think a ‘shrunken’ trouser. Ankle-revealing pants flooded the catwalks for AW15 and they’re the perfect all-round piece for summer, too. 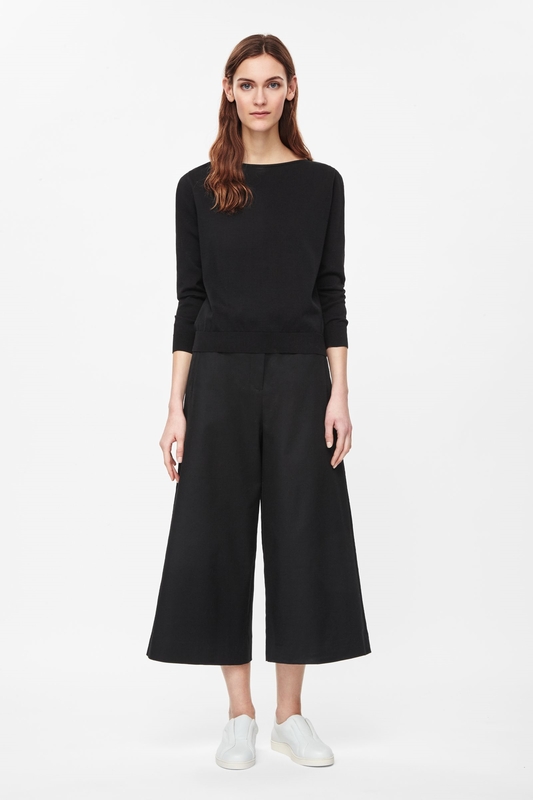 With many fashion editors rocking culottes – the style that’s been bubbling under for the past few seasons and is big on the high-street now – wide-leg trews will be on-trend for a while yet. If you want to stay on the straight and narrow, a tapered version will work for winter, too. 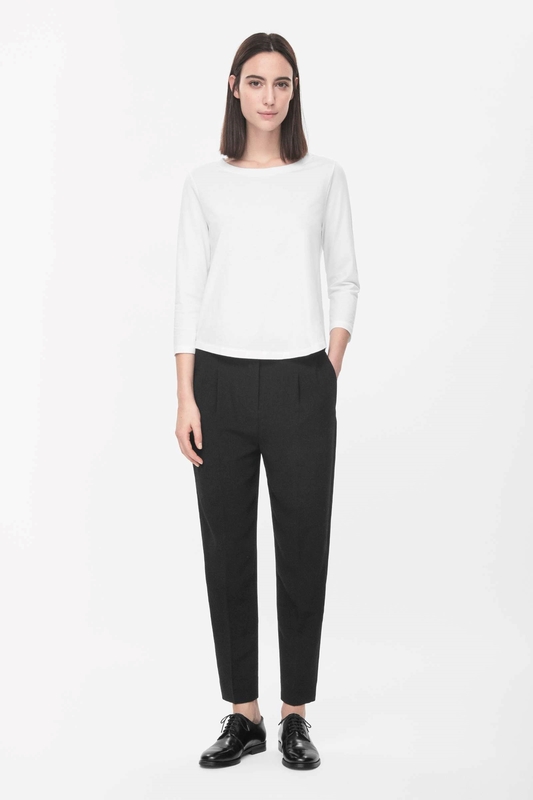 Check out Cos (below) for a great selection of classic cropped trousers that will look great with heels, loafers, trainers and sandals. Need a cosy wardrobe update for the icy British spring? Try next season’s polo neck – as seen on the fashion pack front row at every London show last week. The 70s vibe is strong for autumn and roll necks will be key either layered under shirts and knitwear or making a statement in their own right. 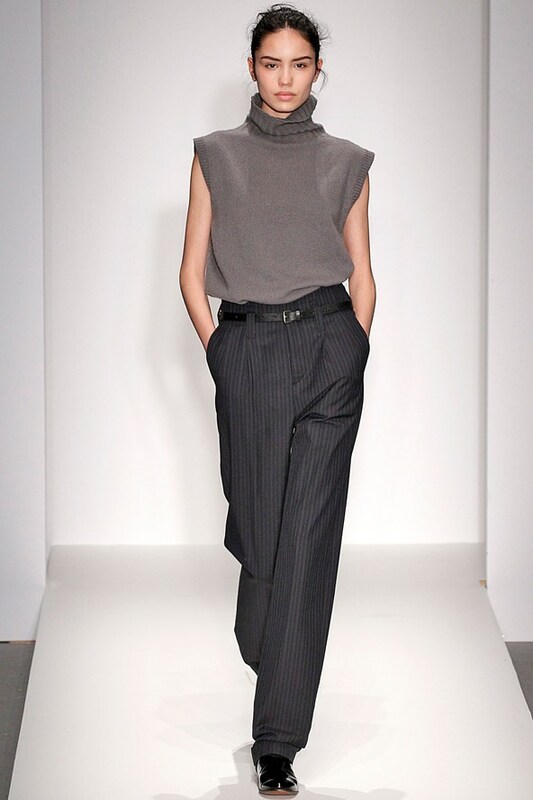 At Margaret Howell they were seen in a variety of guises: plain base layers in black or white; sleeveless in flattering neutrals (below); and luxe, chunky knits in navy, brown and khaki power hues. Time to dig out that long-forgotten polo? Inspired by Taylor Schilling’s prison-issue overalls in hit TV series Orange is the New Black? Quite possibly, but the catwalks were popping with the Tango shade, ranging from turmeric at Victoria Beckham and Roksanda to gentle rust at Topshop Unique and traffic-stopping tangerine at Moschino and Kenzo Pre AW15. It’s the perfect shade to zing up the changes for spring – try Hush’s tangy jumper (below), Topshop‘s bright shopper, or nod to the trend with a lick of OPI nail polish in Are We There Yet? Denim is having a huge moment, inspired by cool-label Marques’Almeida, whose raw 90s’ styles have been a hit with the fashion pack (sparking the Topshop collaboration last year). The new way to ‘do denim’? DIY: take your cue from the editors and bloggers who are customising their jeans and jackets with frayed edges and sandpapered knees and elbows – read ‘distressed’ but not ripped. 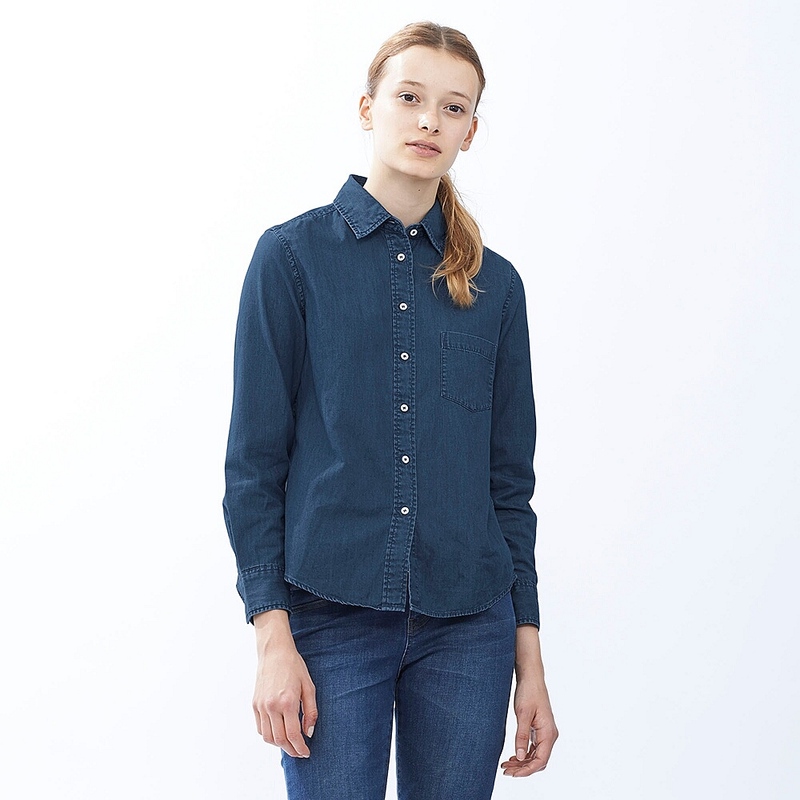 Or, if you prefer your denim more refined, you can’t go wrong with a simple denim shirt for spring (try Uniqlo for denim and chambray styles in a range of washes), a trusty shift dress (find me a high-street store that isn’t doing one this season, but first stop Urban Outfitters and Topshop), or on-trend culottes (Whistles). Is double denim still a thing? What about triple? A shirt, coat and skirt all at once won’t look outré this season. Next season is all about injecting your look with some fun, fun, fun via a quirky accessory. 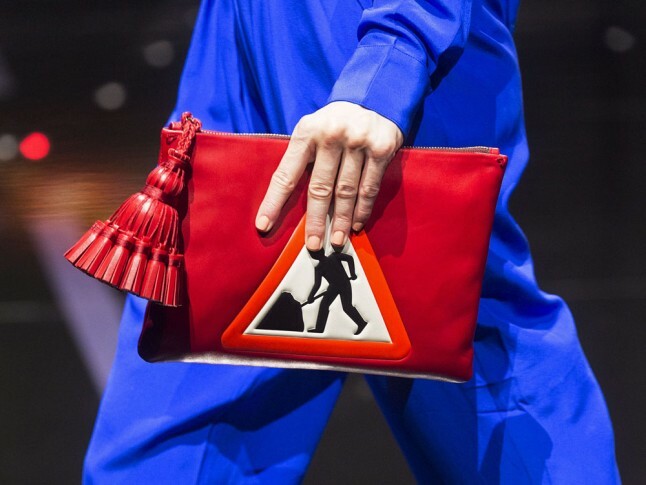 The catwalks were peppered with uplifting add-ons, from mismatched earrings at JW Anderson, to don’t-take-me-seriously bags (road-traffic-sign versions at Anya Hindmarch, fur over-sized clutches at Roksanda, pink-foam clutches at Mary Katrantzou), and even comedy gloves (shark mittens at Wool and the Gang). Might be time to put that chic leather tote to one side and invest in something bright and bonkers for spring – it’ll be bang on trend come autumn, too.